Celebrate strawberry season with this Strawberry Ginger Gin Fizz, it’s so refreshing, you’re going to love it! Click here to pin this Strawberry Ginger Gin Fizz now! It’s that time of the year. The time when organic strawberries start appearing in the produce section of our grocery store. I always try to buy strawberries that are organic, since they are on the dirty dozen list. Have you heard of that list? It’s a list of the top twelve produce items that you should buy organic. It also contains a list of the top twelve that you don’t have to buy organic. I reference it a lot when I’m grocery shopping – so now I pretty much have it memorized. So, when organic strawberries start showing up, I buy a lot. Use what I can and freeze the rest. They freeze beautifully and I have them available all year long. The gorgeous deep reds of the strawberries I got the other day were the inspiration for this Strawberry Ginger Gin Fizz. In the summer, I like my cocktails light and refreshing. To keep them light and refreshing, I almost always use sparkling water or some other carbonated beverage. It gives me lots more to drink without adding extra alcohol or calories. This recipe was super easy to put together. I knew I wanted to make some sort of strawberry gin something or other. Then I walked by my Homemade Ginger Liqueur, and it all clicked. For this recipe, I used the vodka based ginger liqueur instead of the brandy based, just keeping it lighter. 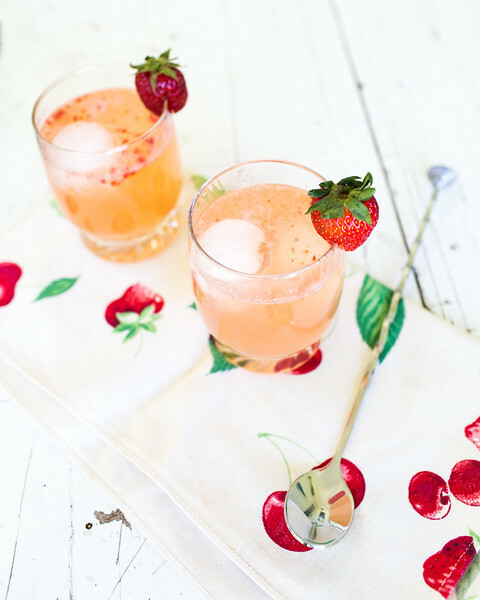 This Strawberry Ginger Gin Fizz is refreshing and not too sweet. The only sweetness comes from the ginger liqueur. If you want yours a little sweeter, just add some simple syrup. If you are looking for some other strawberry cocktails how about these: Strawberry Lemon Heaven, Strawberry Mint Mojito, or the Norwegian Wood Cocktail. Ginger liqueur, strawberries, gin and lime juice make this Strawberry Ginger Gin Fizz refreshing and delicious! Place one of the strawberries in the bottom of a cocktail shaker and muddle it. Add the gin, ginger liqueur, and lime juice. Fill half way with ice and shake for about 15 seconds. Strain into a cocktail glass filled with ice. Top with sparkling water and garnish with a strawberry. This looks right up my alley. I love ginger in a cocktail, and gin is probably my favorite liquor! Timely post – I have all the ingredients on hand! Thanks! I just made one of these and it was delicious!! Thank you! Yum! I’m excited over three things in this post! The dirty dozen list, this drink, and ginger liquer! Ok, maybe 4… Tipsy Tuesday! I don’t post a ton of adult recreational beverages, but when I do, I’ll be back! 🙂 I’m pinning this one! Thanks! What a gorgeous, refreshing summer drink! 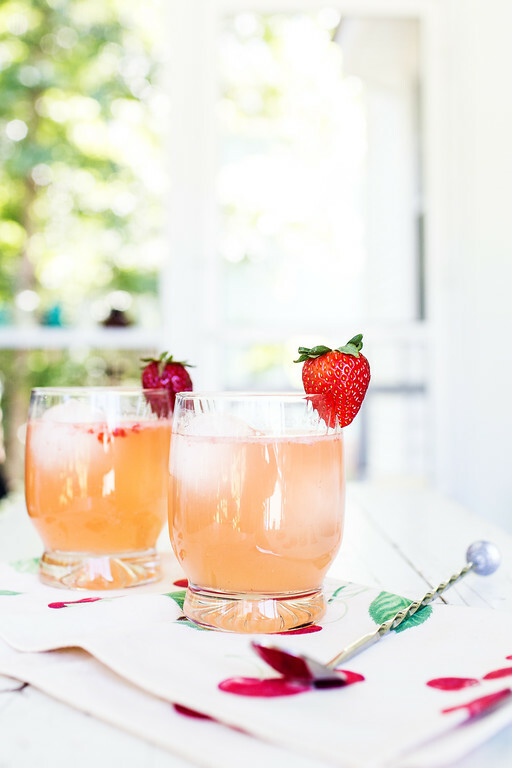 Your Strawberry Ginger Gin Fizz looks so pretty and sounds delicious! Thank you for sharing it with us at the Hearth and Soul Hop, Pam. Delicious great for summer evening, thanks for sharing with Hearth and soul blog hop, pinning and tweeting.